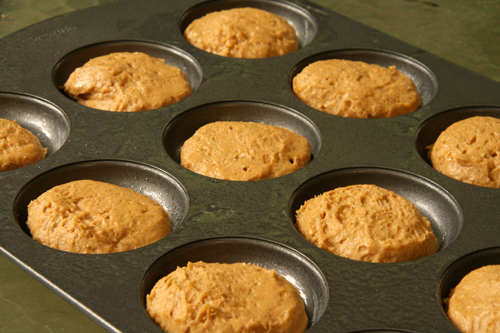 If you are afraid to try something new with pumpkin for the sheer and utter fear that you will soon be addicted to yet one more pumpkin recipe, then run now while you still can. This recipe for these soft and fluffy pumpkin whoopie pies might totally take the cake (pun obviously intended), may be the big pumpkin Kahuna, and will in one bite convince you that perhaps pumpkin is the new chocolate! WHAT THE HE!!???? I DID NOT JUST SAY THAT!! I am the biggest chocoholic in the universe, and I am seriously contemplating the fact that pumpkin in any baked good just might be on par with chocolate. Maybe I need to sit down for a moment and consider the ramifications. But seriously, you have to make them. It is not more difficult than any cake recipe and the only difference is the frosting is in the middle instead of on top like the world’s best sandwich cookie–EVER. Can you imagine anything pairing with a soft and spicy pumpkin cake better than a beautiful creamy maple butter cream…only cream cheese frosting perhaps? This post includes both frosting recipes so you can have two delicious pumpkin whoopie flavors. Really! My family went nuts for the maple butter cream, while I actually preferred the cream cheese frosting myself. Go crazy, make both and if I were you I’d double the cookie recipe because ours disappeared rather quickly. By the way, my plan is also to make a Devil’s food whoopie pie with a pumpkin butter cream frosting. Combine the butter, shortening and brown sugar in the bowl of a stand mixer fitted with a paddle attachment. Cream together and add the pumpkin, egg and vanilla. In a separate medium sized bowl, whisk together the flour through cloves. Add the dry ingredients to the butter mixture in 1/3 increments, creaming together on medium each time and scraping the sides of the bowl in between. Using a medium sized ice cream scoop, scoop the batter and drop onto cookie sheet, separating each cookie by two inches. You will only get three across and three down but they spread out so leave enough room in between. Spray one of your palms with nonstick spray and lightly press each cookie down to help it flatten out a bit. These tend to be fluffy whoopies. Bake in the oven for 15 minutes or until a toothpick inserted in a cookie comes out clean. The cookie should be soft to the touch but bounce back when gently pressed. Cool for 10 minutes on the pan and then remove and place on cooling racks for an hour until completely cooled. To make the Maple Buttercream: In the bowl of a stand mixer fitted with a balloon whisk, cream butter and then add powdered sugar, milk and syrup, beating until smooth. Add an extra 1/4 c. powdered sugar if the frosting is not setting up or is too runny. Place buttercream in a ziploc bag and push all the buttercream to one bottom corner so you can use it as a pastry bag later. Refrigerate for 15 minutes. To make the Cream Cheese Frosting: Cream together the cream cheese, butter and powdered sugar until smooth. Add vanilla and combine on medium speed until smooth and creamy. Place cream cheese frosting in ziploc bag like above. Refrigerate for 15 minutes. To use the ziploc bag as a pastry bag, simply snip off about 1/8 inch of the corner of the bag (the one that has the frosting pushed towards it). Hold the ziploc in your hand and gently push the frosting out the snipped corner. 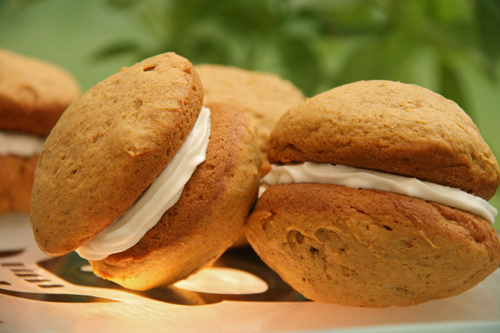 Categories: Cookies, Pumpkin | Tags: blogjacked, pumpkin whoopie pies | Permalink. Oh these look so delicious! I’ve made pumpkin whoopie pies once and they were a huge hit. Now I’m going to crave them for the rest of the week. Never had a pumpkin whoopie pie, Geni, but yours sure do look good! I bet you bake them and then watch them disappear. I know they wouldn’t last long around here. Whoppie pies are a real part of New England life… the state of Maine is trying to make it part of their state dessert. Let the state see your recipe and you will be famous. These don’t scare me one bit. I would welcome them into my home. But then they would mysteriously disappear. Geni, you have a way of getting me so excited way before I get to the actual recipe! Okay, okay, I’m going to make these! I do have new co-workers to impress 🙂 And I know these will be a hit. Do you know, I’ve never made whoopie pies before! I’ll have to use a cookie sheet though, I’m not the queen of baking like you! Oh, my gosh these look delicious! I would be snacking on whoopie pies until I’d worked my way through the entire batch, lol! I love these! What fluffy and delicious looking whoopie pies! Definitely a good tea partner, Yum! So true! Pumpkin is definitely the new chocolate! And I could totally eat a gazillion of these whoopie pies, which means I should really get a whoopie pie pan! I can’t get enough of pumpkin! These whoopie pies are right up my alley. These look so perfect, Geni! So excited about these! So cute and festive. Looks delicious! 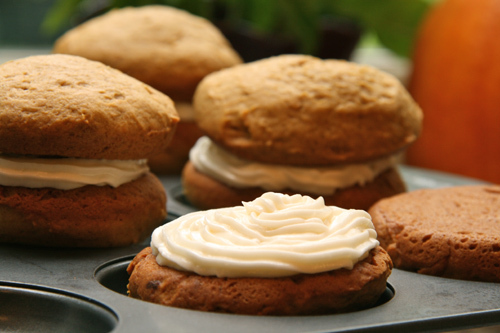 Fluffy Pumpkin Whoopie Pies are a perfect Novemebr treat! A touch of whimsy and sweetness is just what we all need the day after the election! Geni, your pumpkin whoopie looks great especially with the maple buttercream…perfect for the Thanksgiving dinner. I didn’t even know there was such a thing as a whoopie pie pan – where have I been? Love the two options for fillings too. Now bring on the Devil’s food whoopie pie with a pumpkin butter cream frosting – that sounds exciting! Okay this is funny- the comment above me from Shellie is actually my mother. I have been working on redoing her website and I was logged i as her to do stuff with twitter, fb, etc. Anyway- that comment and this one is from little old me- Jessica at Kitchen Belleicious! Sorry for the confusion! Stop if you can! I have a great giveaway! There can’t be much better than pumpkin whoopie pies. Oh my gosh YUM. Then you go and add a maple buttercream filling. You evil, evil woman! 😉 haha And I’m that weirdo who doesn’t really like chocolate, so I’m totally jumping on the “pumpkin is the new chocolate” bandwagon. I think pumpkin can be the new chocolate I think I am with you on the cream cheese frosting. that is my favorite as well. Your whoopie pies are delightfully mile high and fluffy. I haven’t made any whoopie pies in a long time and I am WAY overdue!! I LOVE that they are pumpkin! The browned butter sounds so toasty and delicious! Great idea! I am so glad these worked for you! 🙂 Thank you so much for letting me know. I really appreciate it. There is nothing quite like the fall flavors of pumpkin and maple, and putting them together for a whoopie pie? Genius! These look amazing. I’m glad I can make these without a whoopie pie pan! Thanks for sharing. I love that you’re keeping up the pumpkin sisterhood! I just made pumpkin pancakes and a pumpkin milkshake–your pumpkin pancakes look totally decadent, and these whoopie pies sound irresistible. I like the way you combine maple and pumpkin flavors; I’ve got to try that myself! And I hadn’t even thought of pumpkin mousse. You’re right. Pumpkin IS the new chocolate. Actually, currently looking for a super delicious Southeast Asian-type of pumpkin soup. Let me know if you ever find the perfect pumpkin soup!